For those right-brained personality types, we provide hard-hat tours of the spec homes we now have under construction for Spring delivery. Stepping through a just framed home, one can appreciate the solid concrete block walls, see the pallet of concrete roof tiles, note the arched doorways being framed and how well the heavy-duty roof trusses are anchored to the walls. It is impressive to see the bones of a home designed to withstand a 140 mph wind! Later, at the drywall stage, buyers get a feel for space and liveability. This is the point in the construction process where family members can choose their bedroom location and get a real feel if the layout of the home works for their unique needs. 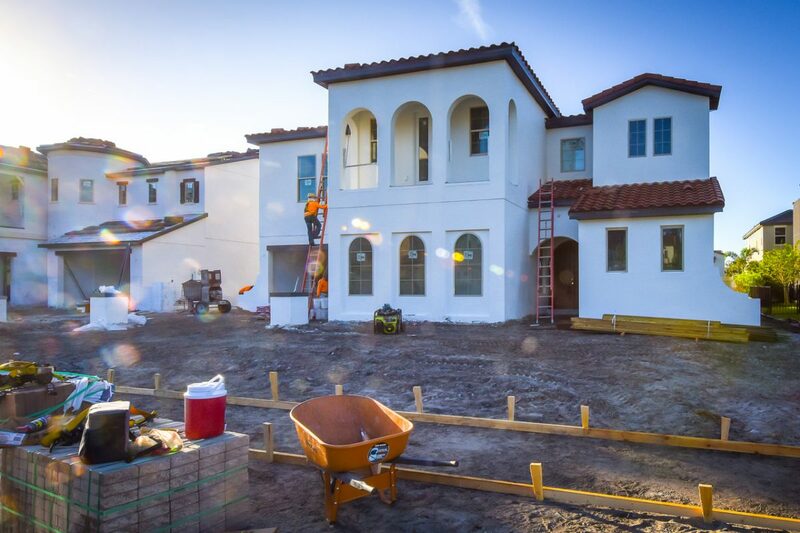 Our four, five and six-bedroom, five-bath homes include a home office, family theater and three garages. Everything you need, nothing you don’t. Touring during the finishing stage, buyers notice our selections, which include flooring, countertops, cabinets and hardware. Upgraded stainless steel KitchenAid® appliances are standard, double islands, hidden pantries and richly detailed tiled backsplashes set our kitchens apart. Its fun to see a European styled walk-in wine cellar under construction and imagine impressing the friends you will entertain. Its exciting to pick from exceptional hardwoods to create your stairway, also standard. Buyers get much more out of visiting a decorated model, after they have seen its “bones”. The biggest joy of buying a new home is choosing colors and hardware and countertops that reflect your personal style. This is the time to revisit the decorated model and the design center to imagine your romantic owner’s suite and blissful master bath with both free-standing tub and rainforest walk-though shower, furniture quality cabinetry, sparkling under mount sinks and refined fixtures. The sales team at Canopy Oaks is available for private appointments and showings daily. Four new homes have been started this month—to accommodate buyers who wish to move in Spring, 2019. Prices at Canopy Oaks range from the $600’s to $1.2 million. The Developer is offering no closing costs and $20,000 in designer upgrades to this month’s purchasers. For information, call 407-488-5588 or visit www.CanopyOaksFL.com. Canopy Oaks has a model home open daily at 12902 Roper Road, Winter Garden.